The word “scrum” almost sounds like an insult, or maybe even the surname of a less than scrupulous character in a Charles Dickens novel. But in fact, scrum is a way to address complexity. Think of it as a simple framework that allows teams to collaborate better when working on complex projects. Scrum comes from software development, where it is part of agile methodology. It’s designed for small teams who are working in what’s called “sprints,” short periods of no longer than 30 days and usually only two weeks. They track their progress by having short meetings. Those brief exchanges are usually only 15-minutes long and are called “standup meetings,” “daily scrums” or, for our purposes, a scrum meeting. They’re sometimes called stand up meetings because team members are usually standing up during them, which is a great technique for keeping the meetings short. It’s all about efficiency when it comes to a scrum meeting. But are there other ways to get the most out of your scrum meeting besides standing up? If you’re in charge of running a scrum meeting, you’ll want to keep it short, get engagement and when you break, have every role on the scrum team what they need to do next. Let’s take a sprint around the subject, and get creative on some ways to run a great scrum meeting. What Is the Daily Scrum Meeting? Typically, a daily scrum meeting is held in the morning and ideally in the same location every day. That makes it easier to become part of a routine, and therefore less likely that it’ll be forgotten or delayed. It’s important to start a scrum meeting early because it provides a context for the day’s work. As noted, the idea is to keep it short and sweet. Stick to the essentials. Get the information that must be communicated out clearly and quickly. The idea is to get commitment from the team, rather than surface-level involvement. That’s the difference between working and cashing a paycheck. Everyone from the scrum master, who is the expert, to the team members must attend the daily scrum meeting. They are all committed and expected to participate. Others, such as sales or people from other projects, can attend but only to listen. What is in our way? Each team member answers the three questions briefly, and then the next person does the same. This is a simple, efficient and fast way to discern what has been done and what still needs to be done. Don’t confuse this with a status report. This isn’t to determine who is ahead, behind or on track. Rather, it’s about getting commitments from each team member. The daily scrum meeting feels fresh, especially if you’re used to the traditional meeting with the long agenda and the never-ending babble around the table as your coffee gets cold and the clock hands move glacially over the dial. But doing anything repeatedly is going to get stale. While you want to keep the scrum meeting short and not waste time with unnecessary frills, you also don’t want to have the team fall into a rut. If people become complacent, they become sloppy. Their focus is dulled and the whole point of the daily scrum meeting will get lost as people’s eyes cloud over with tedium. It’s not that you must grab your spats and tails and put on a whole song and dance, but there are ways to run a scrum meeting in a way that keeps it fresh and starts the day off on the right foot. 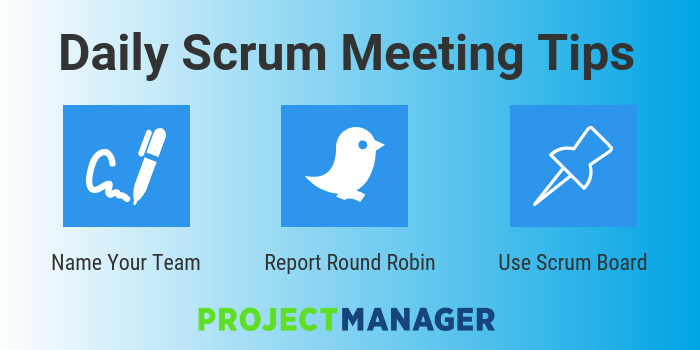 Here are a few ideas to run a better scrum meeting. It might sound silly to give your team a name (after all you’re working not playing), but sometimes a small laugh is all it takes to get the team on the same page. When you assemble the team, before executing the project, see if there’s a commonality among the group. Or, ask them to throw out some names as a fun icebreaker for the meeting. Say they love sea life and call themselves Team Octopus. Well, get them a rubber octopus, and use it like a talking stick to pass around during your scrum meeting. Whoever holds the octopus speaks. It’s a goof, but before you know it, T-shirts are being printed. The point is to get your team bonding and working collectively like the eight arms of their mascot. Ritual is important. It creates structure and embeds that routine, so the ritual can be followed. But you don’t ever want to do something without thinking, which is the danger when you meet every morning and do the same thing repeatedly. For example, going around the team and getting the answers to the three questions that make up a daily scrum meeting. You wait your turn and say your piece, and then on to the next person. To keep team members on their toes and not sucking down hot coffee to stir them from a stupor, try mixing it up. Usually, the scrum master will ask someone to speak, and then they’ll go clockwise or counterclockwise from there. The problem is, each team member can space out a bit until it’s their turn. Instead, have the team report round robin style. That is, ask for a volunteer to get the meeting started with their report. Then, when they’re done, have them pick the next person to speak and so forth. This way everyone is on their toes, and they can even turn it into a team building game, making the meeting productive but playful. A scrum board might not sound like a barrel of monkeys, but as an idea it’s a great way to run a daily scrum meeting effectively. A scrum board is simply a way to visualize the project tasks and their progress. Think of it as a snapshot of the current sprint backlog. Everyone can see at-a-glance what work still needs to get done and what work has been completed. It complements the three questions everyone will answer in the meeting by providing another way to see what has been accomplished and what needs to be done. Not everyone understands in the same way. Some people are more visual thinkers, so a scrum board is going to align better to the way they learn, more so than merely talking about it. Tasks are represented by cards on the board and placed in columns indicating if they’re in progress, need to be done or done. During the scrum meeting those cards can be physically moved as people report on the project, which further emphasizes the information shared and the commitment to get the work done. We got some quotes from real agile professionals who hold scrum meetings every day at their organizations. They had a few additional tips for getting even more productivity out of your scrum meetings. Additionally, for those that are struggling to keep scrum meetings efficient, he says you should use a timer. Hernan Santiesteban, an agile expert at the marketing agency Great Lakes Web, discusses the importance of staying on topic and removing excessive details. We hope these daily scrum meeting tips will help you better implement scrum at your organization! Whether you’re working in sprints or a more traditional methodology, you’re going to need tools to help you get those tasks planned, monitored and reported on. ProjectManager.com is an online project management software that gives you real-time data on a collaborative platform, so after the daily scrum meeting, the team can work together and get more done. Try it for yourself by taking this free 30-day trial.